To tell the truth, I’ve put off playing Versus: The Elite Trials ($3.99) for a while. I didn’t particularly enjoy The Hero Project: Redemption Season ($4.99), the last gamebook from author Zachary Sergi, and I was worried that I had completely forgotten where the story left off at the end of Versus: The Lost Ones ($3.99). That gamebook, which you should definitely play before getting into this one, was something of an information dump. There were too many characters to keep track of, lots of world-building, and a plot that threatened to branch off in some truly confusing directions. With more than a year passing since playing the first chapter of Versus and now, I wasn’t confident that I remembered anything from it anymore and wasn’t looking forward to having to refresh myself. I kept shuffling The Elite Trials to the back of my to-do list, and now that I’ve finished it, I feel pretty silly about doing that. The Elite Trials picks up right where The Lost Ones left off, with your character still on the planet Versus trying to survive and thrive against your competition, all the while wading through complex politics and relationships. 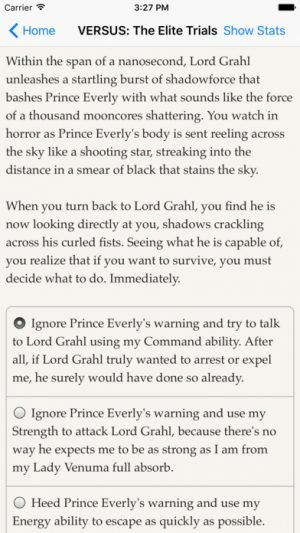 The game kicks off with an optional recap, and if you’ve finished the first book, you can carry your save over to make sure your choices are reflected. Regardless of what you’ve done before, however, you’ll still face many of the same problems. While you survived the opening part of the Versus tournament, you must now face the Elite Trials to see if you have what it takes to join the big leagues. Queen Ashe and her Elite Courte are in danger of being overthrown by the chaotic Lady Venuma, who feels that Versus would be better without a ruling class telling everyone what to do. You’ll have to decide where you stand on that issue, as it comes to a head here. Finally, there’s also the matter of trying to figure out the true identity of the legendary Dhanthik, a slow process of elimination that you can only engage in by walking through the memories of others. There are a lot of plates spinning here, and that’s just at the start. With much of the heavy lifting of world-building done in the first book, The Elite Trials is free to narrow its focus. There aren’t nearly as many characters to juggle here, and even with a few new ones being introduced, everyone gets enough space to stand out. We get to learn a lot more about some of the returning characters, and there are at least a few shocking revelations to be had along the way. The plot has a nice balance of action and drama, and while the first round of the trials feels a little familiar, the other situations you find yourself in feel surprisingly fresh and, at times, very clever. 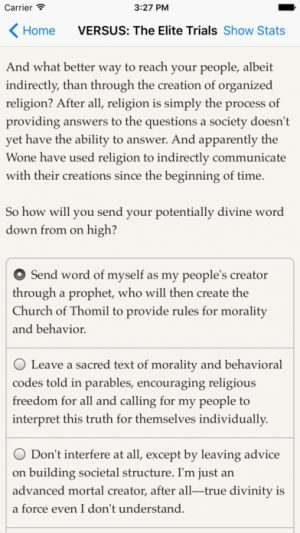 One particular moment that I found really interesting was one where you are tasked with creating a world and the basic rules of its culture as something of a personality test. Do you have a beef with the way our world works and have your own ideas about how things ought to be? Well, here’s your chance to tease them out. Owing to your character’s ability to walk through the memories of others, The Elite Trials finds a nice groove through alternating between the waking world of Versus and the memoryscapes of your associates. Versus acts as an anchor to keep everything moving forward, while the memory walks let the writer’s imagination run a little wild. This gives the game a really nice pace that carries through all the way to its ending. That conclusion feels more solid and satisfying than that of the first book, which suffered somewhat from being an opening chapter. The Elite Trials wraps up a couple of major plot threads while planting the seeds for further conflicts. While there’s one major story thread that remains to be solved, enough gets settled that it feels like important things got done in the course of the plot. It feels like I’m dancing around things here and I am, because I don’t want to spoil anything. I’m just happy to see the pay-off was worth making it through some of the slower parts of The Lost Ones. As usual, author Zachary Sergi touches on a number of real social and political issues during the course of the story. While Sergi has a tendency in some of his books to be a little heavy-handed about these topics, he hits all the right notes here. Nothing feels out of place for the setting, and the characters speak and interact with each other in a generally natural way. That’s not to say The Elite Trials isn’t political, of course. It’s all about politics, when it comes down to it. Yes, there are action scenes and some of the trials involve choosing between various special moves, but the bulk of the choices are about making your way through the competing interests of complicated, slightly-damaged people who all think their way is the right way. It’s a little dystopia, a little utopia, and all of the terrifying ramifications of both of those things. The quality of Sergi’s prose is as strong here as it has ever been, and I ended up taking screenshots of some pages just to marvel at how well-written they were. Ultimately, I think there are a lot of different ways for a gamebook or other similar sorts of interactive stories to succeed. Sometimes, solving them is like solving a good puzzle, requiring you to make the right choices to gather the right items in the right order. In other cases, they can be good strategic challenges, testing you to conserve your resources and play the odds carefully to overcome challenges. Some of them simply want to tell a great story and take you along for the ride. But I think there’s one thing that this particular genre is capable of that few others can handle so easily, and that’s revealing to the player something new about themselves. A carefully designed combination of tough choices, good writing, and thought-provoking scenarios can force us to confront aspects of ourselves that we might never actually need to consider otherwise. For example, I think The Walking Dead did a fantastic job of this sort of thing. It’s rare for a game to pull this off even in this genre, mind you. But when one does manage that trick, it can have a serious impact on the player, and that’s just what happened for me with Versus: The Elite Trials. While it might seem like a subjective thing, and it probably is, Versus: The Elite Trials reflected my choices back at me in such a way that I saw a slightly new side of myself. That alone makes it a great gamebook, in my opinion. Even setting aside personal epiphanies, the improved pacing, more nuanced tone, and the smaller cast of more fully fleshed-out characters make this a far better effort than the first book. As I said at the beginning of the review, though, you’re going to want to play through The Lost Ones before you touch this to get the full effect. But you can now do that knowing that it’s worth the effort of pushing through some of that book’s rougher spots. Versus: The Elite Trials is an excellent gamebook, and I will wait with great anticipation for the next part of the story.